This data set is a part of the Heart Disease Data Set (the part obtained from the V.A. Medical Center, Long Beach and Cleveland Clinic Foundation), using a subset of 14 attributes. 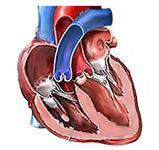 The task is to detect the presence of heart disease in the patient. It is integer valued from 0 (no presence) to 4. This is not a native data set from the KEEL project. It has been obtained from the UCI Machine Learning Repository . The original page where the data set can be found is: http://archive.ics.uci.edu/ml/datasets/Heart+Disease.